Simplicity is the key in this quick and tasty weekday meal! Cook the tortellini as directed and drain. 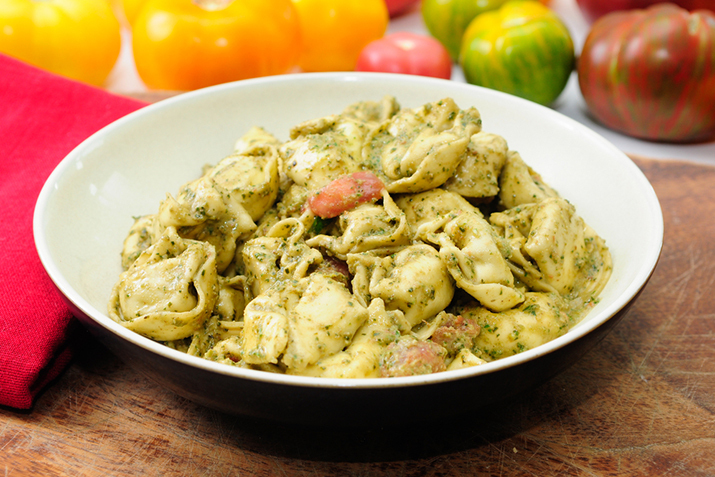 Toss the tortellini with the basil pesto and tomatoes. Garnish with the shredded cheese. For the pesto: In a food processor, combine the garlic, basil, pine nuts, cheese, salt and pepper and pulse until coarsely chopped. Slowly add the olive oil and pulse to form a thick paste. Serve with Caesar salad and crusty bread. Per Serving: 679 calories, 39 g. fat, 81 mg. cholesterol, 59 mg. carbohydrate, 15 g. dietary fiber, 30 g. protein, 814 mg. sodium.